Goodbye, Chief Wahoo. That red-faced Indians logo that always seemed to be deeply sunburned or just blushing from embarrassment has seen his last on a Cleveland uniform. 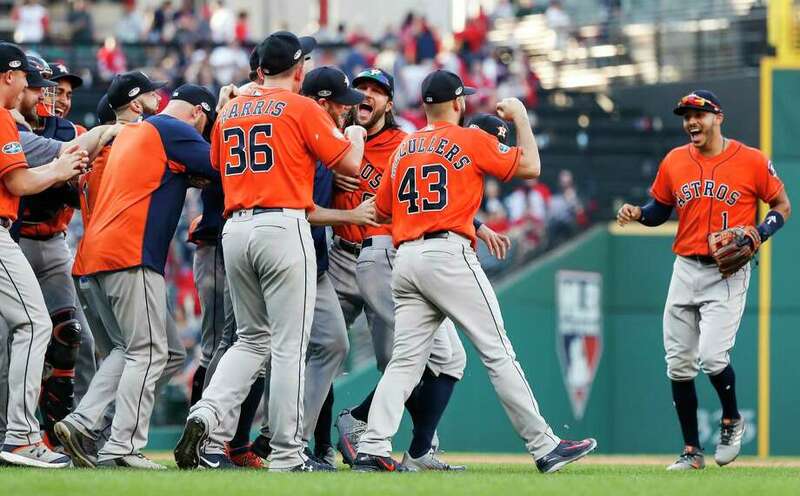 If you're a fan of political correctness, the Astros gave the Chief a proper funeral during an 11-3 scalping at the former Jacobs Field on Monday, sweeping the Ohioans in three games to advance to the league championship series which will begin Saturday. What was a tight, 2-1 Cleveland lead going into the seventh, exploded like a dime store cigar in the face of the Indians bullpen as many of the 37,252 in attendance reacted like they were at a Browns game - disgusted and resigned to failure. George Springer dented Mike Clevinger's shutout bid in the fifth with a solo homer to left. Before the Astros could get cozy, Francisco Lindor answered with his own solo shot down the left field line off Dallas Keuchel to reclaim Cleveland's one-run lead. Both starters were gone by the seventh when Trevor Bauer had a meltdown. Tiny Tony Kemp led off with a single to right then Bauer's pickoff throw to first went awry and Kemp scampered to second. Springer beat out an infield hit that advanced Kemp to third. Jose Altuve bounced into a fielder's choice but Kemp scored to tie the game. Bregman tapped back to the mound and Bauer's throw to second pulled Lindor off the base. It was Bauer's second error of the inning. Yuli Gurriel walked to load the bases. That's when red-hot Marwin Gonzalez stepped to the plate and lined a double into the left field corner. Two runs scored to give the Astros their first lead. Despite a walk, Cleveland got out of the jam without allowing another run to cross. It was 4-2, Houston. The Astros poured it on with a six-run eighth started by Springer's second homer of the day - a majestic shot to right-center off Chad Allen. Springer now has seven dingers in his last seven postseason games (a big league record) and ten overall postseaon homers (a new franchise mark). Gonzalez added an RBI single to center and a wild pitch pushed across another run before Carlos Correa joined the party with a three-run shot into the right field stands for a 10-2 lead. Bregman added an RBI single in the ninth and Cleveland got one final curtain call on a wild pitch by Will Harris to account for the final score. After the clubhouse champagne shower, the Astros begin five days off to relax and be totally healed of any pains. The ALCS will open either in Houston against the Yankees in a 2017 ALCS rerun or begin in Boston against the Red Sox in a best-of-seven showdown. Once the other LDS is settled, there will be more details. TBS will have television rights with Dennis Eckersley, Hazel Mae, David Ortiz, Joe Girardi, Reggie Jackson, Chipper Jones, Charles Barkley, Conan O'Brien, Omarosa and the ubiquitous Beth Mowins at the mic. Game time will be whatever Fox and the Dodgers can spare.